Do you sign cards by mail? Yes but with this caveat: you may have to wait for me to get to it. Signing cards is not a high priority and I do it when I can. Sometimes this means months go by (although I am getting better). I’m perfectly willing to stay in touch, and you can send me an email nudge when you’re getting concerned, but please don’t ask me to sign cards if you cannot be patient. You must arrange to pay return postage in advance. Clients in the US can include a self-addressed stamped envelope. People overseas have gotten American bills from their banks, and tucked the money in among the cards; or they have sent checks in the mail, sent money by PayPal, or have made some other arrangement. For a large signing (over $100 value), I can send you an invoice via Square. What do you charge to sign cards? I am presently asking $1 per signature. 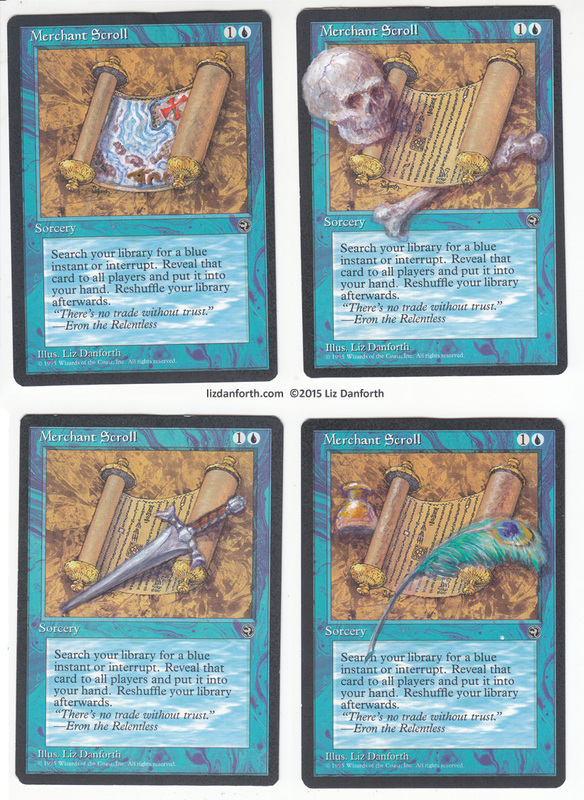 Some people will resell the cards, and some people are truly just fans looking for something cool to put in their playdeck. That’s just the way it is, but it does take time. 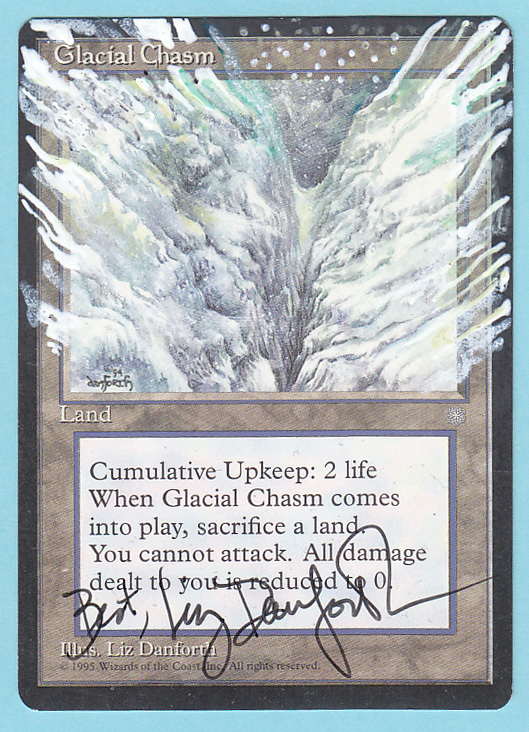 When I look at what other artists do, and talk with them, I find prices for card signings are all over the map. For my own sanity, and because it takes focus away from my time to make new things, this is my compromise. Where do I send my cards? Please use this address: Liz Danforth, PO Box 14824, Tucson AZ 85732 USA. Do you have whiteback artist proofs from Magic? Yes. I am out of some cards (including Hymn to Tourach, which I am asked for most), but I have most others at this time. 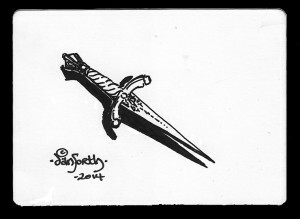 My prices are $10 each for most English-language cards; $8 each for non-English cards. A few cards I am about to run out of — those will be $15 per card. Let me know what card(s) you are interested in, and I’ll let you know if I have what you want. 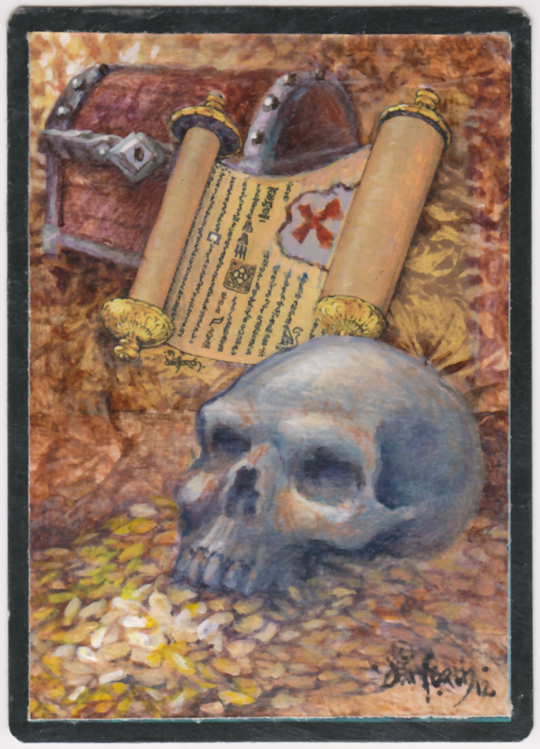 You can find my complete card list here. A signature on the cards you buy is included in the price. Postage to mail them to you is NOT included. If you want a drawing or painting done on the back, see the prices below for a guide. 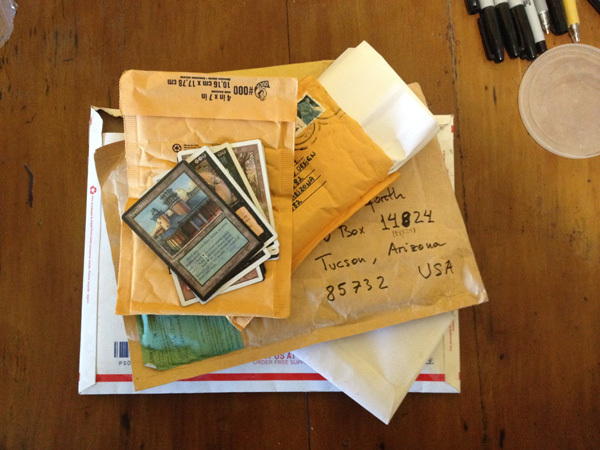 Do you alter or enhance cards by mail? I will but ask you to pay for even a small sketch. Pieces that are more complex cost more, depending on what you request. Occasionally I am asked to sketch on blank-front cards, APs, or index cards. These are commissions like any other, and will be charged for accordingly. 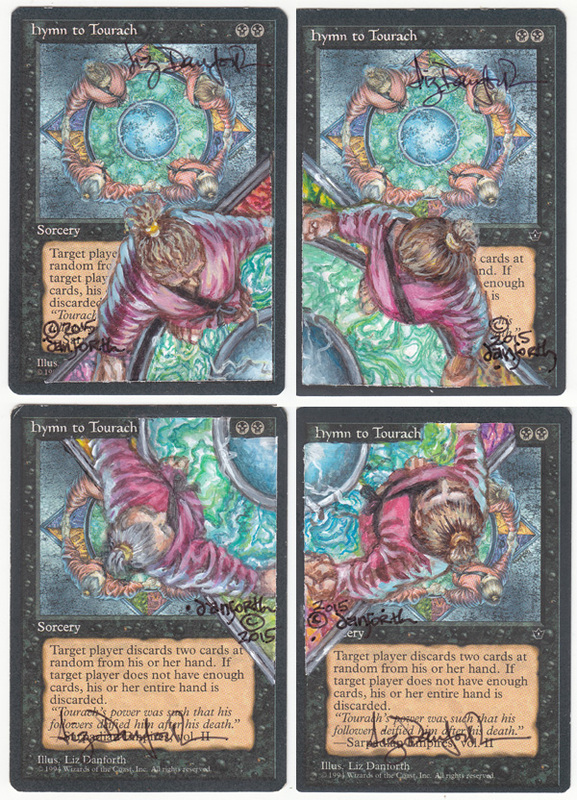 (C) An extensive card alteration, in paint, filling most or all of the card face: usually $85-200. (D) Multicard sets can run as high as $500. 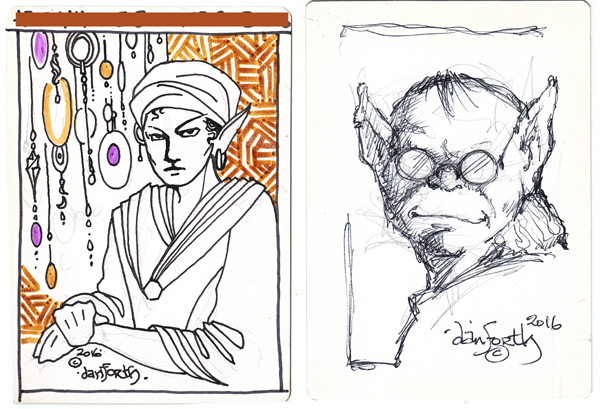 (A) More elaborate examples of sketches on the back of an artist proof ($25-30 for these examples, $10 for each card). 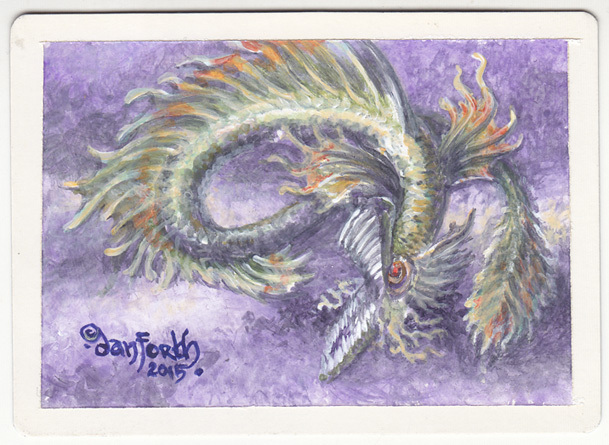 (C) Devouring Deep painted on the AP whiteback of the same card ($160 for artwork, $10 for card). This is pricey. I know another artist who doesn’t charge that much and they are way more famous than you. I do not object to doing these, and they make a nice break sometimes. But I work slowly. Therefore, I charge a premium if it is taking me away from newer work that excites me, challenges me, and that might become your next most favorite Danforth drawing, painting, or story. If your request is a novel idea to me, or intriguing for some reason, you might get a bargain on the price. Give me a little input into the designs (like the Merchant Scrolls above), and I’ll give you more for your money because it lets me have some of the fun! (D) Multicard set of Hymn to Tourach ($500; cards supplied to me). Email me via [liz AT lizdanforth dot com]. I love that Devouring Deep, and fully painted backs should be in the three-digit range. I did some chicken farming a couple years back, and the farmer who ran the impromptu instruction sessions reminded us “If you’re going to sell eggs, don’t do it for less than $4 a dozen. You’re not doing anybody any favors by asking less.” The local economy is a real thing that we don’t completely understand, and it applies as much to art as it does to chickens.